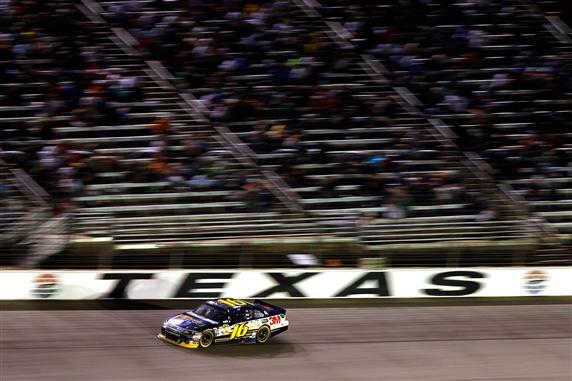 The Texas Motor Speedway event Saturday night was the first time since the Daytona 500 that the NASCAR Sprint Cup Series would race 500 miles in 2012. Back in February, the Daytona International Speedway 500-mile race was not completed until almost 35 hours after its scheduled start time thanks to a rare rain delay and an event that took 3 hours, 36 minutes to completed, minus a two-hour red flag. With exception to a strong wind, Samsung Mobile 500 at Texas Motor Speedway was readied under ideal weather conditions on Saturday night immediately withdrawing any probability of this 7th race on the 2012 NASCAR Sprint Cup Series will be like the Daytona 500. As the #56 NAPA Toyota Camry took for the first pole of the year, Martin Truex Jr joined Mark Martin in adding to the Michael Waltrip Racing tally of qualifying victories in 2012. When the green flag released the 43-car field for the 334-lap Samsung Mobile 500, Truex Jr made use of his top-fielded position to lead the first 31 laps. While the Michael Waltrip Racing #56 Toyota was able to hold the first place position early, pre-race favourite team Roush Fenway Racing began living up to the promise they were showing in practice at Texas Motor Speedway early. Third-fastest in qualifying, Greg Biffle climbed to lead on lap 32 in the #16 Ford. Roush Fenway Racing partner Matt Kenseth in the #17 car would also lead briefly during a pit stop staying near the front all night through the Samsung Mobile 500. With the first pit stops for the NASCAR Sprint Cup teams occurring under green flag conditions, drivers and teams would have no idea they were going to make these higher-stress service stops so often in the Samsung Mobile 500. 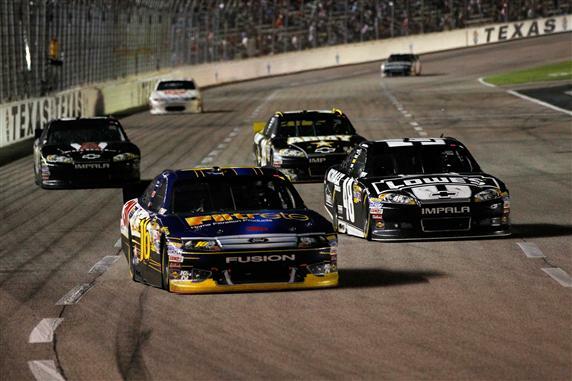 The yellow flag slowed the field of fuel-injected stock cars on just two occasions at Texas. With the lowest previous amount of cautions being five and three earlier Texas Motor Speedway Cup races ending up with 12, the Samsung Mobile 500 would run under green for the final 234 lap. As the Samsung Mobile 500 at Texas Motor Speedway continued at a record pace under green onward from lap 100, the battle for the lead was chiefly centered on three drivers. Martin Truex Jr, Greg Biffle and Jimmie Johnson would lead during sizable portions of the last two-thirds of the event. A late race pit miscue took Truex Jr and the #56 car out of the running for victory of the Texas race. Leaving Biffle and Johnson to battle for the Samsung Mobile 500 trophy, the #48 Chevrolet of Jimmie Johnson was determined to grant car owner Rick Hendrick has 200th NASCAR Sprint Cup Series victory. Leading Saturday’s event for the longest continuous duration of 102 laps, Johnson would roll past lap 300 of the Samsung Mobile 500 in the top position. However, the trip past 300-mark of the Texas event featured a Ford Fusion stalking Johnson. Inching closer on the #48 Lowes Chevy, Greg Biffle would be carrying a full head of steam through the final stint of the race. With just over 30 laps remaining, Greg Biffle stormed past Jimmie Johnson and would sail the #16 Roush Fenway Racing Ford to victory at Texas. Greg Biffle’s victory puts to rest a 49 race winless streak extending back to the Kansas Speedway in 2010. The win in the Samsung Mobile 500 pads the points lead Biffle has accumulated during the first 7 races of 2012. The race was strong for the three major Roush Fenway Racing cars with Biffle’s victory being the topper. Matt Kenseth came across the line 5th and the #99 car Carl Edwards emerged from a 20th place starting position to grab 8th after 500 miles. Greg Biffle leads Matt Kenseth in the current NASCAR Sprint Cup points standings by 19 points following the Texas Motor Speedway event. 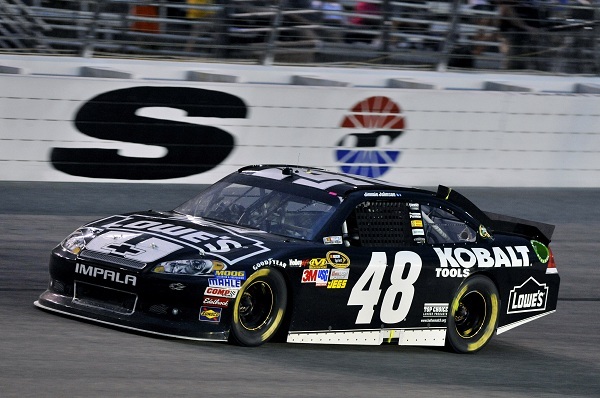 With the 200th win for Hendrick Motorsports foiled at Texas, Johnson hung on to his #48 Chevrolet for the runner-up position in a race that was actually a successful outing for the four-car Chevy team. Jeff Gordon finished 4th and Kasey Kahne earned his first top-10 finish for Hendrick Motorsports with a 7th place run. Fast but misfortunate during Sprint Cup races up to Texas, the strong race for Kahne and the #5 car could be the ingredient for a turnaround this season. Completing the Hendrick Motorsports quartet, the #88 car of Dale Earnhardt Jr cracked the top-10 for the fifth time in 2012. Dale Earnhardt Jr is currently tied with Matt Kenseth in the overall driver’s point count after 7 races in what has been NASCAR’s most popular driver’s most aggressive starts to the season since joining Hendrick Motorsports. The 2012 NASCAR Sprint Cup Series’ next race will be a 400-mile, Sunday afternoon affair at Kansas Speedway.